"fills a gap in the literature...Gehl is an unassuming but essential guide to this criminally underutilized method of analysis." "...it serves also as a knowledge map for those interested in understanding the roots of the renaissance of public spaces as a field of attention in urban planning, looking back at authors that influenced the works not only of Jan Gehl, but also of all those addressing a new understanding of the importance of public life in our cities nowadays." "In sharing how public life-public space interactions can be systematically approached and taught, I don’t hesitate to say that How to Study Public Life is must-read for anybody and everybody entrenched in urban development, design and planning—from students and practitioners to municipal officials and policy makers." "For decades, the public space, public life studies developed by Jan Gehl and his team have been a great inspiration for professionals, academics and city planners in all parts of the world. Now their secret tools are available to everyone in How to Study Public Life. It is just a matter now of getting out there and putting them to use." "This important book is published at a time when the dynamics of urbanization dictate a better integration of urban activities, which Gehl has long shown how to achieve." "Applying the principles of public life studies at the City of Melbourne has proven to be an invaluable tool for making our city more livable. 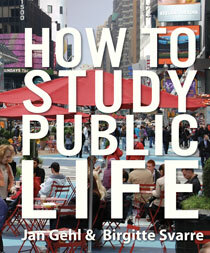 How to Study Public Life is an essential tool-oriented book for all those striving to create better cities for people." "Gehl and Svarre's How to Study Public Life is a refreshing manual for how to engage design professionals and the general public to observe, analyze, and assess the nature of their city." "Thanks to Gehl and Svarre, urban designers have a helpful reference for getting started with the process of getting outside into public spaces to look and learn"
"Danish architect Jan Gehl and coauthor Birgitte Svarre provide a nicely illustrated overview of the the field they call 'public-life studies' in How to Study Public Life." "This is an excellent primer on how to 'recapture public life' as an important dimension in the design of vibrant, pedestrian-friendly city spaces. Gehl and Svarre... offer fine-grained guidance on the range of behaviors to observe, tools to employ for observing and documenting, and the types of life-enhancing design solutions generated from interpretation of collected data... This is an important book for architecture and design programs at all levels." How to Study Public Life was named one of Choice's Outstanding Academic Titles of 2014.